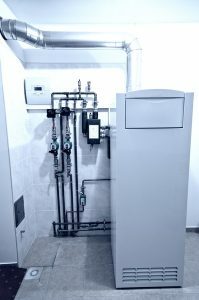 3 Myths About Furnace Efficiency | Clean Air Act Inc. Both heating and air conditioning are no stranger to this myth. It seems like a clever trick, but the reason it doesn’t work is a fundamental misunderstanding of how furnaces work. The idea goes like this: when you want your home to reach a certain temperature, you should actually set the thermostat several degrees past it. A higher temperature equals more heating power, and that equals less time to get to the temperature you actually want. The problem is that your heater does not work like a throttle. No matter what temperature you set it to, the heater won’t work any harder or faster—it will only work longer and have to go through more heating cycles. If you do all of your heating in only a couple of rooms, it might make sense to buy a couple of space heaters instead of a furnace. Some people even say that you can get away with lower costs by using the space heaters, instead! Actually, since space heaters use electricity, they’re going to be more expensive. Natural gas is a cheaper fuel source—hence one of the reasons why gas furnaces are still so widely used. If you’re trying to use space heaters to make up for the work of a gas furnace, you’ll definitely be wasting money. If your aim is to only heat a couple rooms, you might consider asking a residential heating service in Portland about your options. A ductless mini-split system might just be what you need. This one’s difficult to face, because everything about it makes sense. After all, why would the vents be adjustable if not for the purpose of closing and opening them? In reality, closing the vents will increase energy use and possibly harm your system. The simplest way to explain it is that your furnace was installed specifically for the size of your home, so closing the vents would this cause your furnace to become too powerful for the opened spaces. This increases pressure through the ducts, and that can damage your furnace or the ductwork itself. Some of the consequences include increased energy use, cracking the heat exchanger, condensation and mold growth, and more. Need some help lowering your heating bill? We can help with that! Contact the Clean Air Act today.